Cardiff Bus, the Council-owned company operates the bus system covering Cardiff, Caerphilly, Barry and the Vale of Glamorgan. The Cardiff buses also ply to other areas like Penarth, Newport, Senghenydd, Blackwood and Tredegar. These buses are well used by locals, tourists and visitors. 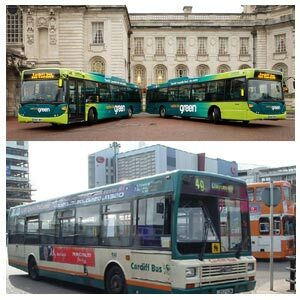 Apart from connecting these locales, the Cardiff buses also ply to many other cities and towns in England and Wales including the main airports in London as well as nearby Bath, Bristol, Birmingham and Exeter. Most of the buses at Cardiff depart from the main bus station in Wood Street, in the centre of Cardiff. The bus route schedules and timetables are available at the bus stations. Cardiff Bus, which celebrated its centenary on 2002, was started in 1902 by the City Council. Initially, Electric trams were used and the first service ran between Newport Road (Roath) Depot and the Town Centre. Slowly in the following decades the tramways extended their operations with the help of single deck and double deck trams and widened their coverage. Subsequently motorbuses were also introduced and the first diesel engined motorbus appeared in 1932. However the tramways were replaced in 1942 with further extension of the network to Ely, Fairwater, Llandaff, Rhiwbina, Llanishen, Cyncoed, Rumney and Tremorfa. Prices of Cardiff bus tickets are priced according to the length of journey, although visitors to the city may find it better to purchase a day pass, allowing unlimited travel on the day of issue. These may be purchased on the buses, at the travel shop in Wood Street opposite the main bus station and in many city centre hotels. Some of these passes include a one-day pass or Capital Ticket, which can be used for journey on a single day. However Capital ticket can be used only for the Cardiff Bus that covers the region of Cardiff and Penarth. Similarly, there is a Multi-ride ticket that can be used for seven days. Multi-ride tickets can also be bought to include travel in the Vale of Glamorgan, Barry, Caerphilly or Newport, at an extra cost. Alternatively, Cardiff trains service the Cardiff and Glamorgan Heritage Coast, along with destinations in the Valleys courtesy the 'Valley Lines'. The city is well served with two stations, Cardiff Central and Queen Street, both situated in the centre of the city, within close proximity of the bus station. The Valley Lines Cardiff trains also operate a regular service to the main outlying areas of Cardiff and into the South Wales Valleys. The Cardiff trains cover wide areas connecting important cities across Wales and rest of England. Apart from the Cardiff Central and Queen Street stations, the city also has number of other stations that include Ninian Park, Cardiff Bay and Cathays.